Define issues and solve problems faster by characterizing your device, system or signal more completely and rapidly than previously possible with swept spectrum analyzers. Tektronix RSA2200A Series Real-Time Spectrum Analyzers capture many signals not viewable on swept spectrum analyzers by seamlessly capturing and storing a span of RF frequencies all at one time*1. Once a signal is captured it can be viewed simultaneously and analyzed in time-correlated frequency, time and modulation domains. RSA Series instruments include not only Real-Time Spectrum Analyzer fast-signal capture, internal memory and modulation analysis but also functionality and operation of a swept spectrum analyzer for looking at very wide spans, all in an integrated, transportable package. RSA Series Spectrogram uniquely shows time-varying signal behavior in frequency change/stability, spectrum occupancy, pulsed signal timing, power change and more! The sample on this page shows the frequency settling characteristic of a transmitting device. Time-correlated multi-domain view provides a new level of insight about design or operational problems and possible solutions. The example on this page includes frequency, time, and modulation domain views of an AM-modulated pulsed signal with pulse-to-pulse phase variation measured in the modulation domain. Sensitive and fast, RSA Series Real-Time Spectrum Analyzer triggering easily captures unknown, periodic or intermittent signals. Using the Tektronix exclusive Frequency Mask Trigger, you can configure a custom frequency domain mask including signal guard bands and levels then trigger on events isolated to a specific frequency or frequency range. As signals are captured, they are automatically saved to RSA internal memory, making it easy to perform in-depth, time-correlated analysis across the frequency, time and modulation domains with no external computer required! Quick-to-set-up IF Level and Power (Span Bandwidth) triggers provide very convenient capture of signals in applications such as incident carrier-and-response interaction between two devices or burst signal carrier ramp up. Continuous Trigger Mode ensures a sequence of events are automatically captured into memory; you capture only the events and not time in between, maximizing memory efficiency and minimizing analysis time. ± (RE × MF + 0.001 × Span + RFM ) Hz. RE = Reference Frequency Error. MF = Marker Frequency [Hz]. RFM = Residual FM [Hz]. At spans ≤10 MHz, all frequency components of the signal must be contained in the analysis period and span. Accuracy: RE × CF + RFM. Resolution Setting = 1 mHz to 1 MHz. At 2 GHz ±4.01 kHz. At 5 GHz ±10.01 kHz. At 7 GHz ±14..01 kHz. At spans ≤10 MHz for RSA2200A Opt. 10, all frequency components of the signal must be contained in the analysis period and span. At 2 GHz ±202 Hz. At 5 GHz ±502 Hz. At 7 GHz ±702 Hz. Carrier Power, > –40 dbfs (typical) (dBfs = dB below full screen reference). 50 Hz to 3 GHz, (Start Frequency ≥20 MHz). 50 Hz to 20 MHz, (Stop Frequency < 20 MHz, Opt. 05). 100 Hz – 10 MHz, 1-2-5 sequence (RF); 20 MHz (Baseband). Span = 0 Hz (Simultaneous with 50 Hz to 10 MHz Span in second analysis window). Range - 1 Hz to 10 MHz, automatically selected or user defined. Accuracy - Within 6.0% ±0.1%. Shape Characteristic - Gaussian, <5:1 Shape Factor (3:60 dB); Rectangular, Nyquist, Root Nyquist shapes may also be selected. Number of Samples per Frame - 64 to 8192 (65536 samples / frame, extended resolution). Window Types - Rectangular, Parzen, Welch, Sine-Lobe, Hanning, Sine-Cubed, Sine-To-The-4th, Hamming, Blackman, Rosenfield, Blackman-Harris 3A, Blackman-Harris 3B, Blackman-Harris 4A, Blackman-Harris 4B, FlatTopn. Residual FM at 1 kHz RBW - RSA2203A and RSA2208A: 10 Hz p-p; 2 Hz p-p (Opt. 10). 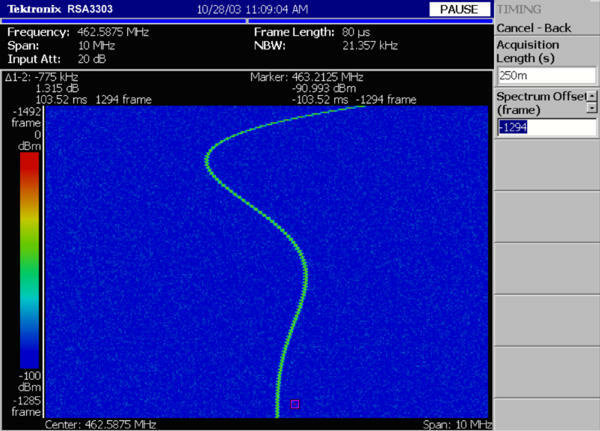 Span >50 Hz, 64 – 240001 (RBW mode), 18 – 240001 (FFT mode). Span = 0 Hz (Time and Demodulation Modes). RSA2203A and RSA2008A – IQ Data Pairs: 1024 to 512000; Power vs. Time: 1 to 512000. RSA2203A and RSA2208A - Free run, single, external, IF level (10 MHz BW). ≤5 MHz (100% probability of intercept), signal occupying at least one complete ≥160 μs frame). 10 MHz (50% probability of intercept, signal occupying at least one complete 80 μs frame (typical)). 15/20 MHz (25% probability of intercept, signal occupying at least one complete 40 μs frame (typical)). Frequency Mask Range - 0 to -6 divisions from Reference Level at 10 dB/div. Mask Shape - User Defined. Minimum Horizontal Mask Setting Resolution - < 0.2% of Span. Minimum Frequency Width - < 0.2% of Span. Displayed average noise level to MAX safe input. RSA2203A, RSA2208A - 0 – 50 dB, 10 dB steps. Average Continuous - +30 dBm (RF ATT ≥ 10 dB). Peak Pulse Power - +30 dBm (RF ATT ≥ 10 dB). DC - RSA2203A, RSA2208A: ±0 .2 V (CF ≥ 20 MHz); ±5 V DC – 20 MHz (Opt. 05). RSA2203A, RSA2208A: < –73 dBc (Ref Level = +5 dBm , RF Att.= 20 dB, total signal power = -7 dBm, signal separation 300 kHz). RSA2208A: < –72 dBc (Ref Level = +5 dBm , RF Att.= 20 dB, total signal power = -7 dBm, signal separation 300 kHz). 20 MHz - 3 GHz: –90 dBm. 1 MHz - 20 MHz (Opt. 05): –93 dBm. 20 MHz - 3.5 GHz: –90 dBm. 3.5 GHz - 8 GHz: –85 dBm. RSA2203A, RSA2208A - +0 dBm (RF ATT = 0 dB, 2 GHz). *1 RSA2203A or RSA2208A Opt. 05 only. Log Display Range - 10 μdB/div to 10 dB/div. Linear Display Scale - 10 divisions. Linear Display Units - dBm, dBμV, V, Watts + Hz for FM Demod, Degrees for PM Demod. Marker Readout Resolution, Log - 0.01 dB. Marker Readout Resolution, Linear - 0.001 μV. < 0.5 dB for all values of attenuation. At Reference Setting - ±0.5 dB (RF) at 50 MHz CF, –20 dBm signal, 0 dB ATT, 20 °C to 30 °C; ±0.3 (baseband) (Opt. 05) at 10 MHz CF, –20 dBm signal, 0 dB ATT, 20 °C to 30 °C. Overall Amplitude Accuracy - ±0.7 dB (RF) + Frequency Response. *4RSA2203A and RSA2208A Opt. 05 only,. 1 Hz to 10 MHz - ± 0.05 dB. Range - –51 to +30 dBm. 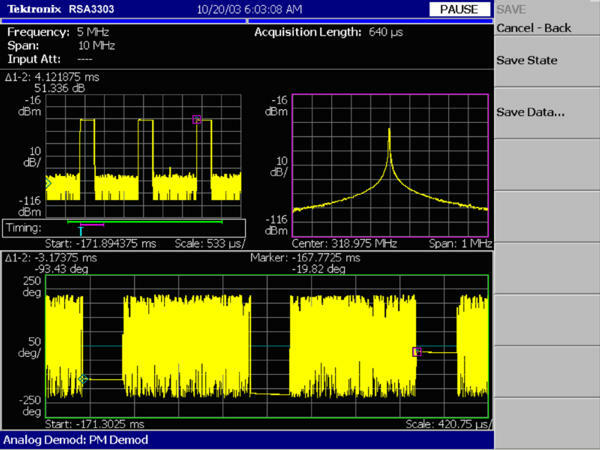 Accuracy - ±0.2 dB (–10 dBm to –50 dBm) at 50 MHz. Log scale (max. cumulative), > 0 dB – 50 dB - < ±0.2 dB; < ±0.12 dB, typical at 0 dBm reference level. Linear scale - ±2% of Reference Level. Linear to Log scale Switching Uncertainty - 0.05%. Amplitude Reference Output - –20 dBm, 50 MHz, internally switched to input. Memory Depth (Samples) - RSA2203A and RSA2208A: 512 ksamples. Real-Time Capture Bandwidth (Seamless Data Capture) - RSA2203A and RSA2208A: 10 MHz (rf); 20 MHz, DC – 20 MHz (Baseband (Opt.05)). Data Samples per Frame (Real-Time S/A Mode) - 1024. Block Size (Number of Frames) - RSA2203A and RSA2208A: 1 to 500. Maximum A/D Sampling Rate and Resolution - 51.2 Msamples/sec, 14 bits. Screen Update Rate - 38/Sec, (SA Mode, 2 MHz span, 128 point FFT). 35/Sec, (SA Mode, 2 MHz span, 1024 point FFT). Remote Measurement Rate and GPIB Transfer rate - 7000 Samples/Sec at 2 MHz span Auto RBW Spectrum data. Ethernet Transfer Rate - 2.6 Mbyte/Sec (256 Mbyte .IQT file transfer). RF Center Frequency Switching Time - <10 ms for 10 MHz frequency change; <500 ms for 3 GHz frequency change. Traces - 2 traces, Spectrum Analyzer Mode. Trace Types - Normal (RMS), Average, Max Hold, Min Hold. Display Detection - Max, Min, Max/Min. Input - 50 Ω, type N.
Preamp Power - RSA2203A and RSA2208A: LEMO 6 pin connector - Pin 1, NC; Pin 2, ID1; Pin 3,ID2; Pin 4, -12V; Pin 5, GND; Pin 6, +12V. 10 MHz REF OUT - 50 Ω, BNC, >–3 dBm. 10 MHz REF IN - 50 Ω, BNC, –10 dBm – +6 dBm. EXT TRIG IN - Ext Trig. BNC, High: 1.6 to 5.0 V, Low: 0 to 0.5 V.
TRIGGER OUT - 50 Ω, BNC, High >2.0 V, Low: < 0.4 V (output current 1 mA). LAN Interface (Ethernet) - 10/100 Base-T (std.). Serial Interface - USB 1.1, 2 ports. VGA Output - VGA compatible, 15 pin DSUB. Automated Measurements - Channel Power, ACPR, Carrier to Noise, Occupied BW, Carrier Frequency, Emission BW, Spurious Search, CCDF, dB/Hz Mkr, dBc/Hz Mkr. Frequency Range - 100 MHz – 3 GHz. Noise Figure - 6.5 dB at 2 GHz. Minimum Input Level - -40 dBfs*2, typical. Range - 0.8 Hz to 12.8 MHz. Accuracy - ± 1% of span (Signal at center screen, input level –10 dBfs*2). Accuracy - ±2 % (Signal at center screen, input level –10 dBfs*2, 10 % to 60 % modulation depth). Accuracy - ±3°, (Signal at center screen, input level –10 dBfs*2). PM Scale, Max, Min - ± 180°. Operating: +10 °C to +40 °C. Storage: –20 °C to +60 °C. Warm-up Time - 20 min. UL 61010B-1; CSA C22.2 No.1010.1. EC Council Low Voltage Directive (LVD) 73/23/EEC, amended by 93/68/EEC. EC Council EMC Directive 89/336/EEC, amended by 93/68/EEC. Power Requirements - 100 VAC to 240 VAC, 47 Hz to 63 Hz. Power Consumption - 350 VA max. Data Storage - Internal HDD (20 GB) + USB port + Floppy Disk Drive. Weight, without options - 19 kg. 215 mm (H) x 425 mm (D) x 425 mm (W) without bumpers and feet. 238 mm (H) x 470 mm (D) x 445 mm (W) with bumpers and feet. Calibration Interval - 1 year.